Coming back to the world history it is possible to notice that from the beginning of its origin, even in primitive society, there were certain codes of human behavior, that provided the way of peoples’ life . The simplest facilities of adjusting relations in family groups, that can be considered an initial form to the moral, began to develop in the time of matriarchy. Exactly, at that time appeared the ideas of necessity to engage in labor, to arrange the way of life, to submit and to move itself in the presence with people of higher status, about the error of kinship marriages. In the days of slavery a morality developed more among free citizens. There is no sense to talk about the morality of slaves and proprietors because it hasn’t existed yet. Slave-holders behaved to them as to the things, and slaves hated them for it. Of course, moral and ethic norms improved with the development of society, acquiring all new forms. In the epoch of antiquity, with the development of ethic science, stormy discussions of different moral problems took place by the well-known thinkers and philosophers such as Aristotle, Socrates, Diogenes, Aristippus, Epicurus, Plato. In this period moral became as the obligatory phenomenon. The first laws were based on the ethic norms and rules. They gave an opportunity to judge the society honestly and were spread all over the world. In the medieval world society joined in itself aspiring to the improvement of it s existence and at the same time cruelty, that was also one of their main aims at that time. Christian ideology influenced on morality very much. It gave the basis for formation moral rules. Another side of the Middle Ages was knighthood. A knight was called as a character of ideal man that held in himself such moral qualities as courage, honor, generosity, loyalty. Such characters of knight absorbed in themselves all positive qualities that then and until now are considered as the major values of human morality. During capitalism moral changed considerably. Medieval presentations stepped back on their background, and humanistic conceptions of Renaissance age became instead of them. Actually, the greatest value was satisfaction of necessities and wishes of a man, development of personality, getting pleasure of life. Although this epoch was humanistic, it is considered the period of moral degradation . High- level officials, priests that had to be an example for ther society, often conducted the self-willed and dissolute way of life. However Renaissance age put a large footprint on the development of moral problems , as ideas of human freedom, equality of rights, humanism. These ideas became firmly established exactly in this period. The concept of individualism appeared in bourgeois period, ,where only self development and self-perfection would result to ideal morality of society and happiness. Everybody was formally autonomous. Every person had a right to make a choice and was responsible for his decision. On such principle everyone had to be socially equal, however, actually everything was not as it had to be. A capitalist that owned sufficiencies exploited an ordinary worker. A communistic morality propagandized life for society. The greatest virtues were considered devotion to communism, patriotism, public useful work, intolerance to breaking public norms. However, this morality didn’t seemed to be humane in the plan of right equality It largely encroached on the freedom of citizens, as all had to submit political interests. The power tried to force out the traditional moral norms of different people. There were repressions and starvations on this basis. Such moral internalss as sincerity, veracity, initiativeness, ability to think critically yielded to criticism. Although the communist morality had a few positive lines it was built on fear of repressions. On the basis of science development, appearing of new global problems of society, fast-moving progress in all spheres of peoples’ life appeared a new moral view to the world. Finding oneself on the fracture of centuries, people more and more worry for their future. There are a lot of new problems that need to be decided in all levels of activity, in particular, in moral too. Today the most important condition of positive development of the world is the peace and mutual understanding among countries and people of different nationalities. And it may be only for the keeping the moral mode of society. However, there are such problems as hunger, poverty, illiteracy, population explosion, environmental preservation now. Thinkers of present time put considerable hopes on science and technique. Thanks for them? It is possible to achieve a great progress in the development of society. For a man that wants, that his behavior was moral, an observance of moral norms and rules is very important. Although these norms can differ depending on religion of man, territory, where he or she lives, to his or her world view. In my opinion, morality can’t be named obligatory. Because if the moral norms must be executed, moral principles, ideals, reasons, values are different for everybody. That what for one is moral, for other can be amoral. So morality in this aspect is the subjective phenomenon. In the modern world a moral envelops all spheres of our life. Whatever type of activity we are engaged in, everywhere there is certain moral norms, rules of etiquette, that are needed to adhere to for the achievement of high professionalism. A moral aspect is sent to the decision of common to all mankind problems, such as hunger, poverty, gender inequality, wars between the states, national wars and many others. 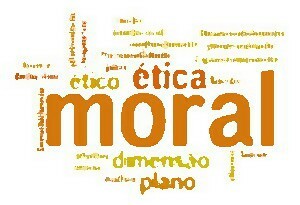 I consider that a morality is important part of mutual relations between people. In fact, it regulates all spheres of peoples’ life and whatever nationality we would be, where did not live, all of us are combined by certain traditions and customs that help us to find a common language and decide the problems of humanity. This entry was posted in Social on 12/05/2016 by Mary.